After hacking social media accounts of HBO and its widely watched show Game of Thrones, a notorious group of hackers calling itself OurMine took control over the official Twitter and Facebook accounts for Sony's PlayStation Network (PSN) on Sunday. After taking over the accounts, OurMine, Saudi Arabian group of hackers which claims to be a "white hat" security firm, posted its first tweet on Sunday evening, claiming to have breached PlayStation Network and stolen its database. The tweet followed by a series of tweets encouraging the company to contact the hacking group through its website to buy its IT security service in an effort to protect itself from future cyber attacks. 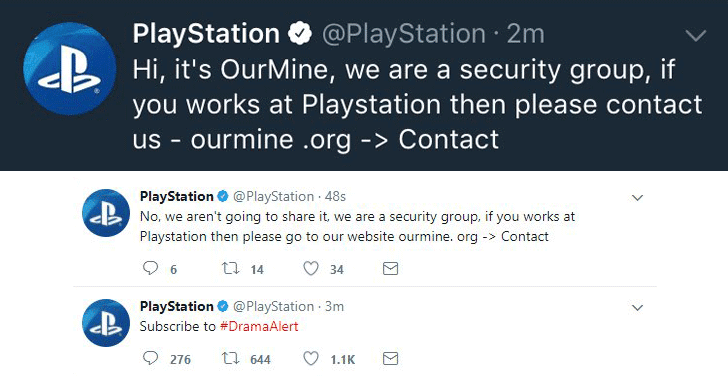 "PlayStation Network Databases leaked #OurMine," the first tweet by OurMine on the compromised PlayStation Twitter account read. "No, we aren't going to share it, we are a security group if you work at PlayStation then please go to our website," the followed Tweet read. The hacking group also posted similar content on the PlayStation Network's official Facebook page that has more than 37 million followers. Both tweets and Facebook messages posted by the hacking group were deleted shortly. At the time, it is unclear if OurMine has access to PSN's database or their Tweets and Facebook posts were just to spread fear among the company and its customers. 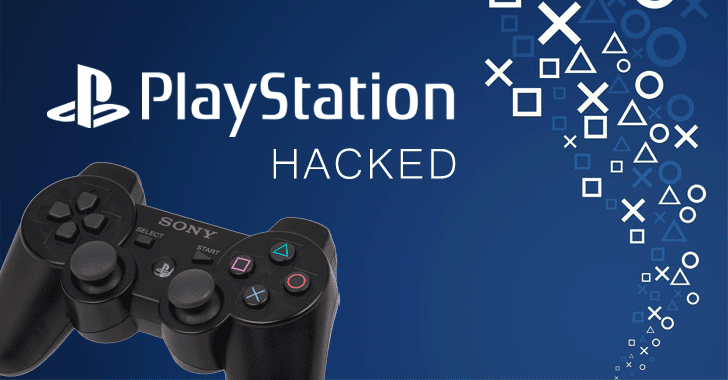 However, the company suffered a massive data breach in 2011, when the PlayStation hack exposed the personal details of the entire PSN user base (over 77 Million at the time), including users names, date of births, email addresses, and credit card details. The hacking incident was the largest identity theft on record, which forced Sony to shut down its entire system for almost a month. Anonymous took responsibility for the data breach. Ourmine is the same hacking group that previously compromised social media accounts of major companies CEOs, including Facebook CEO Mark Zuckerberg, Twitter CEO Jack Dorsey, and Google CEO Sundar Pichai. In the majority of cases, Ourmine gains access to the social media accounts by using credentials exposed in previous, publicly known data breaches. However, the group does not seem to ever go beyond just demonstrating its ability to take over the account, without doing significant damage to the accounts or its protected information. OurMine markets itself as a security firm that offers companies security against cyber attacks, charging up to $5,000 for a "scan" of their social media accounts, site security holes, and other security vulnerabilities.